Francesca Hayward and Alexander Campbell are quickly becoming The Royal Ballet’s ‘couple to see’. After recent successes dancing Clara and the Nutcracker, as well as the Sugar Plum Fairy and her Prince, over the Christmas season, they have just debuted in Giselle. An important moment in the career of any dancer. 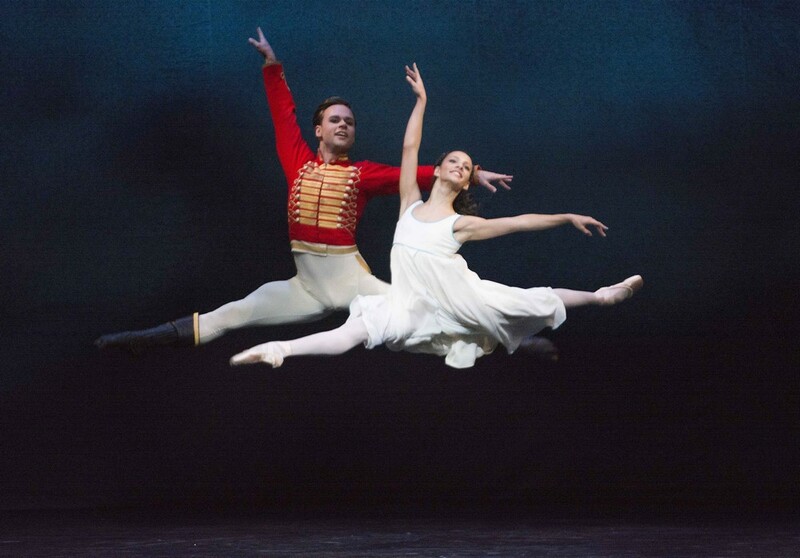 The Guardian said that Hayward was “nothing less than exquisite” and remarked on the “illusion of spontaneity” she brings to the choreography, while The Telegraph was blown away by Campbell’s “immersion in character” and the “punch of his dancing”. Another test passed triumphantly. Facebook was awash with appreciative comments the next day: critics are useful; a fan-base is indispensable. Hayward and Campbell first danced together when she was a last-minute substitute as Clara in December 2013. It was seeing The Nutcracker that set Hayward off on her ballet journey, though she saw it on video. Her grandparents, wanting to keep her occupied, bought her a copy “on a whim”. I still feel emotional every time I dance Clara and the Sugar Plum as they are definitely a realisation of my dream. Two of my favourite and most emotional moments are Clara and Hans Peter’s pas de deux in Act One and the Grand Pas de Deux of the Sugar Plum Prince and the Sugar Plum Fairy in Act Two. They are probably the two parts I danced the most from the whole ballet when I was little, dancing them at home by myself, and the music always gives me goosebumps no matter how many times I hear it. Last season, soon after the end of The Nutcracker run came The Sleeping Beauty. During that period Hayward and Campbell performed together as Clara and the Nutcracker/Hans-Peter (in Peter Wright’s version of the ballet, Drosselmeyer’s nephew, Hans-Peter, has been transformed into a Nutcracker Doll), the Sugar Plum Fairy and the Prince, Bluebird and Princess Florine, and they debuted together as Aurora and Prince Florimund. It was probably about three or four months in total rehearsing and performing together — says Campbell — and I feel like it was hugely beneficial to us, as it gave us a lot of time to get to know one another. It felt as though we were able to take things from each of the performances and build on that as we worked towards the next one. It was one of the most enjoyable times in my career. It’s been great to have a consistent partner to learn the art of pas de deux a little better and I think we have a lot of respect for each other. We’ve shared some important debuts and daunting first night shows together! So, what makes the partnership work? Francesca is a very intelligent performer and her approach to performances and to developing a character isn’t too dissimilar to mine. I think we both like things to make sense in our head when we are out there on stage. When it comes together and works well it is a really satisfying feeling. Most importantly we hear and feel the music with the same musicality. This is great as it means we can be more flexible and adaptable with our steps together. If the music’s faster or slower, I can take a little longer or make a step a little quicker without panicking him as I know he is with me and won’t be surprised! I have complete trust in him to always have my back… quite literally! An excellent coach can make the difference between a series of steps and a dance, between approximated moves and those executed with all nuances the choreographer intended. None is better than The Royal Ballet’s Lesley Collier, who was a Principal Dancer with the company from 1972 until her retirement in 1995 and has been a répétiteur at Covent Garden for almost two decades. She also happens to be the Sugar Plum Fairy in the video that inspired Hayward to start dancing. Lesley Collier has coached us for nearly all our roles together. I think she’s a wonderful coach as she has always learned the steps through the music and the story, and the thoughts and feelings that go with marrying the two. I personally find it really hard to be inspired when I am taught something by being given rigid counts. The Royal Ballet’s practice to invite its retired stars to coach carries on through the generations; former Royal Ballet Principal Jonathan Cope became a répétiteur immediately after he stopped dancing in 2005. Alexander and I were also coached for The Sleeping Beauty by Jonathan Cope which was immensely helpful for the technical aspects like lifts and grips. It was also an amazing chance to dance with him — he would often lift me and partner me to show us how to do it! It took me quite a while not to be star struck by her – this was the ballerina who created Rhapsody with Baryshnikov after all! But, that aside, she is incredibly caring and knowledgeable, and it’s been a real pleasure getting to work with her. I have a real appreciation for Lesley’s commitment and eye for detail and I know that Francesca looks up to Lesley a great deal. It’s great to have Lesley pass down comments and notes from Ashton and Macmillan. Lesley was the first Sugar Plum Fairy and Lise from La fille mal gardée that I watched on a video as a child, so it’s incredible to be in the studio being taught these ballets by her. Not every little girl who watches a ballet video starts taking ballet classes, and very few young dancers get into a company, but for Hayward, there was to be a promotion every year with The Royal Ballet from 2013 until she became a Principal Dancer in 2016. When Kevin O’Hare [Director of The Royal Ballet] promoted me I hadn’t done any big tutu roles yet — The Sugar Plum Fairy and Aurora were yet to come — so I think he saw the potential for that, but really I think he saw that I was capable of dancing the bigger roles because I could convincingly tell a story which is essential to nearly any ballet. I think he also knows that I’m generally pretty calm and I take everything in my stride both on stage and off. One of the qualities I most admire about Mikhail Baryshnikov is the sense that he performs everything with real commitment and sincerity. It is something that I try to bring to my own performances and I believe it is a quality that really stands out. I certainly appreciate it in others when I see it. He crossed the globe to study for a short while at the Royal Ballet Upper School before joining the Birmingham Royal Ballet. In 2011 he moved to The Royal Ballet as was promoted to Principal Dancer in 2016, the same year as Hayward. I would say that my versatility has probably helped me get to where I am. I think that the biggest joy and challenge for the Principals of The Royal Ballet is having to perform the vast amount of repertoire we have here, often with conflicting styles and demands, at the highest possible level. Becoming a Principal and being entrusted with roles such as Prince Florimund in The Sleeping Beauty and Albrecht in Giselle has widened his horizons even more. Both these roles have allowed me to work really hard on my classical technique and it’s forced me to examine the way I do certain things. My aim is always to work hard on the technical elements in class and rehearsals so that by the time we get to performances the steps are just an extension of the character I am playing as opposed to a series of steps and enchaînnements. It’s a lot easier in theory than in practice but that is the aim! After Giselle, Hayward and Campbell will both be dancing in The Winter’s Tale, though not together, and will team up again for Manon in April. I’ve enjoyed everything we’ve worked on together so far and I hope that we will have the opportunity to develop this relationship further as I feel it could be something quite special. One ballet to add on to the list of possible future collaborations would be Romeo and Juliet. I saw Francesca perform Juliet for the first time and I thought that it was a really beautiful interpretation of the role — I’d love to play against it because I think she gives her partners, and all the cast members around her, so much to work with. Here’s hoping! I mentioned sincerity on stage as something that I admire in performers and I think that Francesca displays absolute sincerity whenever she performs. It makes it very easy for me to play off and it is genuinely exciting to be onstage with her. Who knows what the future’s got in store, but I hope we have a lot more Nutcrackers ahead of us! Really enjoyed this article. Thank you for sharing it. Seeing two dancers bringing out the best in each other is a treat for audiences.